Tens of thousand years ago, this land was covered with lush tropical rain forests. The fertile land, temperate climatic conditions, abundant natural resources attracted early settlers and migrants throughtout the subsequent periods, even up to the present. Rich cultures amalgamated into distinct life styles. Emerging out of a thousand years of consciously striving for unity were the T'ai people. City states soon unified into an independent kingdom. Emergent also was a distinct culture known as Thai. Ancient Ban Chiang culture existed in scattered areas throughout the Northeastern region of Thailand. The people lived near watersources in dense forests. They gradually cleared the forest for settlements. They hunted with axes, spears, arrows, sling shots and fishing hooks. They cultivated rice in irrigated paddies and learnt to use buffalos in farming. They wove cloth out of natural fibres and might have printed patterns on the fabric by using rollers. 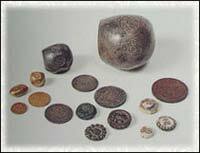 They made and wore decorative ornaments such as glass beads, earthenware amulets and bronze bangles. They made stylistic pottery which had applied or and painted decorations both for household use and for ritualistic burial. They became proficient metal workers quite early in prehistory, and discovered the use of iron almost contemporaneous with bronze. Open: Tue - Sat 11:00 - 19:00, Sundays 12:00 - 18:00, Mondays closed exhibitions. Specializes in contemporary quality art from Thailand, Vietnam and Burma. Has a permanent collection and organizes regular Paintings for sale. Features regular exhibitions by well known Chinese artists from the mainland. Works for sale. Has a permanent collection of some well known national artists. Also features regular shows by Thai and non-Thai artists,sometimes for sale. University gallery with exhibitions mostly by staff and students. Sometimes has works for sale. Private University gallery with regular exhibitions, both Thai and non-Thai. Sometimes has works for sale. Tel. (662) 218 2964 university gallery. University Gallery with regular exhibitions, often by Bangkok non-Thai artists. Most progressive Works seldom for sale. Tisco Tower, North Sathorn rd. Commercial gallery with permanent collection and regular Bangkok exhibitions by well known (often traditional) Thai artists. Co-op Housing Building, 109 Thoet Damri Rd. Experimental art centre for avant-garde art, often installations and performances. Bangkok Works usually not for sale. Exhibition venue often showing young Thai artists' works.Bangkok Works usually for sale. No permanent collection. Royal City Avenue, Rama IX Rd. Commercial gallery showing works by both well known Thai Bangkok and non-Thai artists. Sometimes has works for sale. Art space with a variety, Pom Prap of activities including exhibitions,Bangkok (Chinatown) performances, installations, etc. Works usually not for sale. No permanent collection. Open: 9:30 - 16:00 Tuesday - Saturday (- 14:00 on Sundays) No permanent collection. Small exhibition space within Nelson Hayes Library an old library.Features regular exhibitions by Thai and non-Thai artists. Works usually for sale. Commercial gallery with irregular shows by Thai artists. Works usually for sale.